Feile Brian Boru has come to a close for another year and we hope you enjoyed this year’s celebrations. We would like to thank most sincerely everyone who helped in any way with this year’s festival. Failte Ireland, Clare County Council, Tipperary County Council, Waterways Ireland, The Lakeside Hotel & Leisure Centre, The Department of Children and Youth Affairs and the Killaloe/Ballina Community & Family Resource Centre for their ongoing support, and to all the local businesses for their valuable sponsorship and support of Féile Brian Ború 2018. Ballina Engineering; Brian Boru Feis; The Lakeside Hotel & Leisure Centre; Trident Holiday Homes. The 2018 Feile Brian Boru programme has been finalised and printed copies will soon be available in local businesses. From Wednesday 4th – Sunday 8th July, there will be something to suit all ages – Fireworks over the River Shannon, Traditional Family Fun day, Water Zorbing, pond dipping, bug hunts and a great range of workshops for children, teenagers and adults, including Drama, Traditional singing, Beginners Art, Gardening & Rock Art. Tickets for workshops are now available from the Killaloe/Ballina Community & Family Resource Centre. We hope you will join us in celebrating our 25th annual festival. 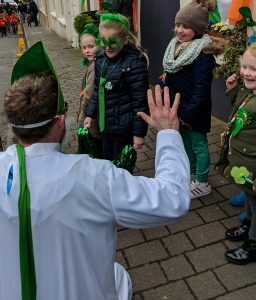 Despite the bitterly cold day, hundreds of people lined the streets for the 2018 Ballina/Killaloe St. Patrick’s Day parade and the organising committee would like to say a huge thanks to all those who helped make the day such a success. Our group drummers who led this years’ parade, St. Patrick and our Piper Brian O’Connell, who played at two parades on the day. Ballina GAA, Ballina/Killaloe RFC, Birdhill FC, Birdhill Tidy Towns, CarPal, Darkness into Light & Killaloe/Ballina Community & Family Resource Centre, East Clare Farmers Hunt, 11th Clare Scouts Clonlara, Irish Taekwondo Academy, Killaloe 5th/22nd Scouts, Lough Derg FC, Nuala’s Tuamgraney, Sasha Morrissey Irish Dance School, Smith O’Brien’s GAA, Vintage Tractor driven by John Bowman & Vintage Car driven by Paddy & Patsy O’Brien. We would also like to say a huge thank you to all the floats who continued from the Green to Lakes Nursing Home to entertain the many residents who were getting into the spirit of our feast day. The dignitories who were present on the reviewing stand – Fr. 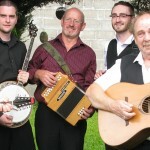 James Grace, Inspector David Finnerty, Councillor Michael Begley and Timmy Dooley, T.D. We would also like to thank the following who, due to other commitments, were not able to attend on the day – Councillor Phyll Bugler, Cllr. Joe Cooney, Councillor Ger Darcy, Councillor Tony O’Brien and Sadie Scanlan. The parade stewards, including two willing volunteers who were visiting from North Carolina & all those who helped out with the preparations on the day. Allied Irish Bank, Birdhill Tidy Towns, Brian Ború on the Hill, Car Pal, Darkness into Light, Derg House B&B, Farrell’s SPAR, Flanagan’s on the Lake, Harry Brann Auctioneers, Killaloe/Ballina Community and Family Resource Centre, Killaloe Post Office, Larkin’s Gala, McKeogh’s Hardware, Sasha Morrissey Irish Dance School, Scoop’s Ice-Cream Parlour, The Lakeside Hotel & Leisure Centre, The Seanachoí Bar, Walsh’s Bar. Best Dressed Window: O’Donovan’s Insurance, Killaloe for their excellent interpretation of St. Patrick “Driving” the Snakes out of Ireland. I think we have found one of our judges for next year! There were a number of competitions held during Feile Brian Boru 2017.
a Samoyed belonging to Susan O’Donoghue from Killaloe and handled by her son James. Highly commended in this category was Theo, a Rottweiler handled by Liam O’Flynn from Ballina and his granddaughter Zoe. Fáilte Ireland, Clare County Council, Tipperary County Council, Waterways Ireland, The Lakeside Hotel & Leisure Centre, The Department of Children and Youth Affairs and the Killaloe/Ballina Community & Family Resource Centre for their ongoing support, and to all the local businesses for their valuable sponsorship and support of Féile Brian Ború 2017. Arra Communications; Ballina Engineering; Brian Boru Feis; Flanagan’s on the Lake; Kincora House B&B; The Lakeside Hotel & Leisure Centre; Trident Holiday Homes. A huge thanks to the Lakeside Hotel Leisure Centre who sponsored the swim hats. A huge thanks to the sponsors of this competition – Fine Rags; Green Cross Pharmacy; Grogan’s Pharmacy; J’adore Nail & Beauty; M.L.’s. 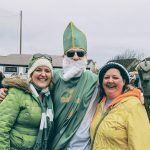 Following a most successful St. Patrick’s Day parade in Ballina/ Killaloe the organising committee would like to thank all those who helped make the day such a success. The dignitories who were present on the reviewing stand – Councillor Michael Begley, Councillor Phyll Bugler, Cllr. Joe Cooney, Timmy Dooley T.D., Fr. James Grace, Fr. Edmond O’Rahelly, Inspector John O’Sullivan, Reverend Gary Paulsen and Sadie Scanlan. A Dog’s Life, Alchemy, Allied Irish Bank, An Siopa Beag, Ballina Engineering, Ballina Handball Club, Birdhill Tidy Towns, Brian Ború on the Hill, Car Pal, Clare/Tipp Properties, 11th Clare Scouting Clonlara, Card Connections, Collins Pharmacy Ballina, Collins Pharmacy & The Celtic Cat Killaloe, Darkness into Light, Derg Credit Union, Derg House B&B, East Clare Hunt, E&G Hardware, Farrell’s SPAR, Fine Rags, Flanagan’s on the Lake, Harry Brann Auctioneers, K9 Grooming, Killaloe/Ballina Community and Family Resource Centre, Killaloe Post Office, Killaloe Sailing Club, Killaloe Scouts, Larkin’s Gala, Lough Derg F.C., McKeogh’s Hardware, Molly’s Bar & Restaurant, Ponte Vecchio, Quay Arts, Reddan’s Bar, Sasha Morrissey Irish Dancing, Simply Delicious, Supervalu, The Anchor Inn, The Lakeside Hotel & Leisure Centre, Unislim, Walsh’s Bar. The judging panel would like to commend all other entries in the parade who put so much thought and work into their floats. We look forward to seeing you for Féile Brian Ború 2016 which will take place from Thursday 30th June – Sunday 3rd July. 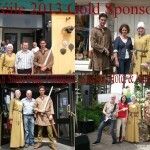 Follow us on Facebook (www.facebook.com/Feilebrianboru) to get updates on this years’ festival. 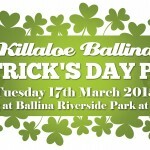 The 2016 Ballina/Killaloe St. Patrick’s Day Parade will take place on Thursday 17th March. The parade will leave Ballina GAA Complex at 2:30pm and follow it’s usual route through the twin-towns, finishing in The Green, Killaloe. 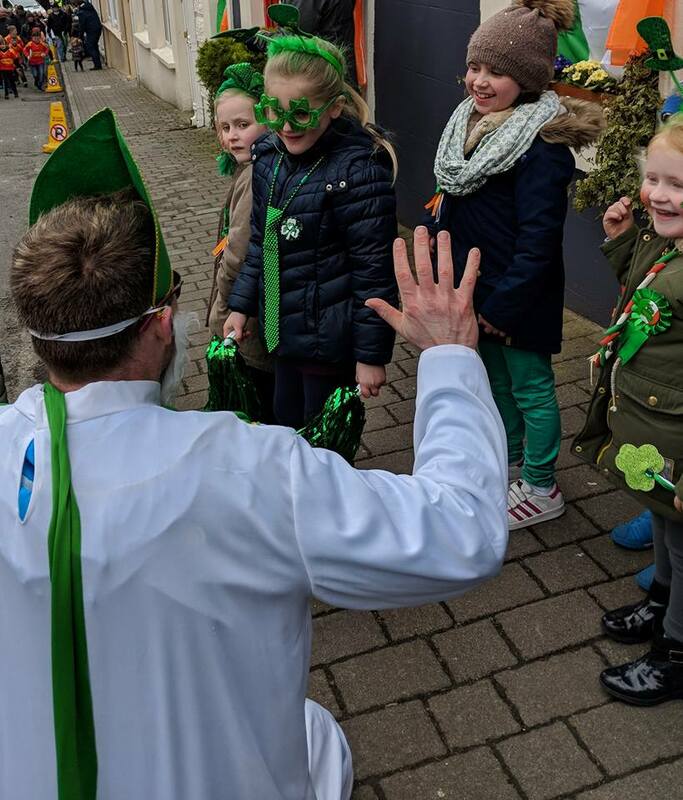 The organising committee are encouraging all businesses, clubs, organisations and individuals to get involved in the 2016 Ballina/Killaloe St. Patrick’s Day parade and enter a float in the parade – All creative interpretations are welcome! Best Overall Float / Best Business Float / Best Club / Best Topical Float / Special Merit Award / Best 1916 Commemoration Float – As we are commemorating Easter 1916 this year, we will be presenting a prize for the float which best depicts 1916. A prize will also be presented on the day for the business or home with the Best Dressed Window so if you would like to help add colour to the streets of Ballina/Killaloe by decorating your window(s), please download an entry form Best Dressed Window application or e-mail info@feilebrianboru.com. 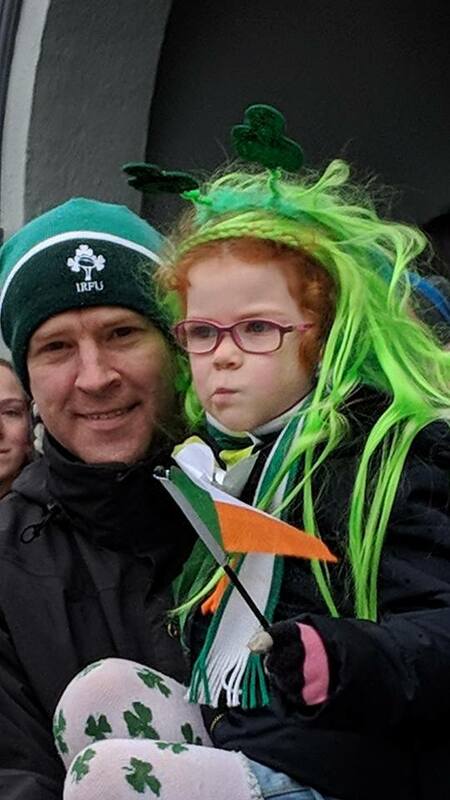 We hope you will join us in celebrating the 2016 Ballina/Killaloe St. Patrick’s Day Parade in style! The organising committee are looking for volunteers/First Aiders on the day to assist during the parade. If you would like to give one hour of your time, please contact John Grimes 086/2587819 or Paddy Collins 087/2615406 or e-mail info@feilebrianboru.com. A huge thanks to all those who have already volunteered to help out over the festival weekend. However, we are still looking for people to assist with events on Saturday 4th & Sunday 5th July to sell Féile Wristbands, to assist with Strut your Mutt Dog Show and to assist with stewarding. If you would like to lend a hand, you can contact us by e-mail: info@feilebrianboru.com, send us a message on Facebook or contact 086 3586293. Féile Brian Ború 2015 is Here! 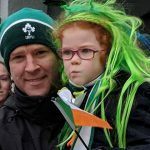 Over the next five fun-filled days, experience a variety of excellent events including: The Furey’s Live in Concert; A stunning Fireworks display over the River Shannon; Traditional Craft Experience with CELT; Traditional Games; Animal Magic with their amazing display of animals; Strut your Mutt Dog Show; Return of the Warriors Street Pageant; Historical Guided Tours; Street theatre; Live Music; The BBC – The Ború Busking Competition; Comedy Night; Children’s Art; Art Exhibitions & Displays; Table Quiz; Farmer’s Market; Craft Fair; Garden Party; Shannon Swim; Soul SUP & much, much more…..
We hope you will come along and help us commemorate Brian Ború in style. Fun and entertainment for all the family guaranteed! On Sat. 4th July from 9pm, make sure you come out and line the streets of Ballina & Killaloe to welcome back the survivors of the Battle of Clontarf – the remaining Dal Cassian soldiers who have travelled from Armagh after burying their High King, Brian Ború. These warriors will be led into Ballina by the Armagh Rhymers (www.armaghrhymers.com) and will walk to the Palace of Kincora (The Green, Killaloe). We invite you all to dress in TRADITIONAL COSTUME and assemble on the streets of both towns and in the Green to welcome back these brave soldiers. A prize will be presented for the Best Costume(s). Details of how to make simple costumes are available on our website. If you would like to dress up and join in this pageant, please contact us by e-mail: info@feilebrianboru.com, send us a message on Facebook or contact 086 3586293. Adam Fogarty – 6th Class Ballina Primary School. The winning poems will be read out in Killaloe Library on Wed. 1st July at 7pm so come along and listen to the works of these budding poets. Overall winner – Aiden Foley (Age 10) Ogonnelloe National School. The winning Masterpieces will be on display in the windows of Bridge House Studios Art & Framing shop from Wed. 1st – Sun. 5th July so come along and take a look. Kindly sponsored by Bridge House Studios. Feile Brian Boru 2015 is less than one month away. 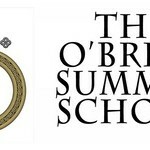 This year’s programme of events is almost finalized and it’s going to be a good one! Printed programmes will soon be available in our local shops & businesses. You will also find details on our website of how to purchase tickets for the Furey’s Live in Concert in the Lakeside Hotel, along with registration forms for Strut your Mutt Dog Show and the Shannon Swim and also details of how to make a simple costume to be part of our street pageant “Return of the Warriors”. 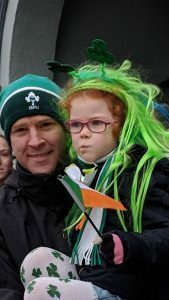 This year’s parade will leave Ballina GAA Complex @ 2:30pm and it will follow the usual route, finishing in the Green, Killaloe. The sun shone down in Killaloe/Ballina last Saturday as Ireland’s Greatest High King, Brian Ború, was honoured in his native place with the unveiling of a shield commemorating the 1,000th anniversary of his death at the Battle of Clontarf. This shield was unveiled by local historian Seán Kierse and Co. Clare based blacksmith Mark Wilson. Prior to the unveiling the crowd were treated to a performance by a group of Transition Year students from St. Anne’s Community College, Killaloe who performed the Kincora Call. “We are delighted to be here today to commemorate Brian Ború” said John Grimes, Chairperson of the Féile Brian Ború committee. “Féile Brian Ború was set up in 1993 with the aim of celebrating Brian Ború’s life in his native place and even back then, we hoped that we would be able to do something like this to commemorate Brian Ború in 2014. We hope that this shield will be here for many years to come” John thanked everyone who had been involved, in particular, Mark Wilson, who had put so much work into this piece. John also commended Séan Kierse, local historian, who had imparted so much information about Brian Ború over the years. John also thanked Mr. Kierse for his support of Féile Brian Ború and for his help with setting up Féile Brian Ború 21 years ago. 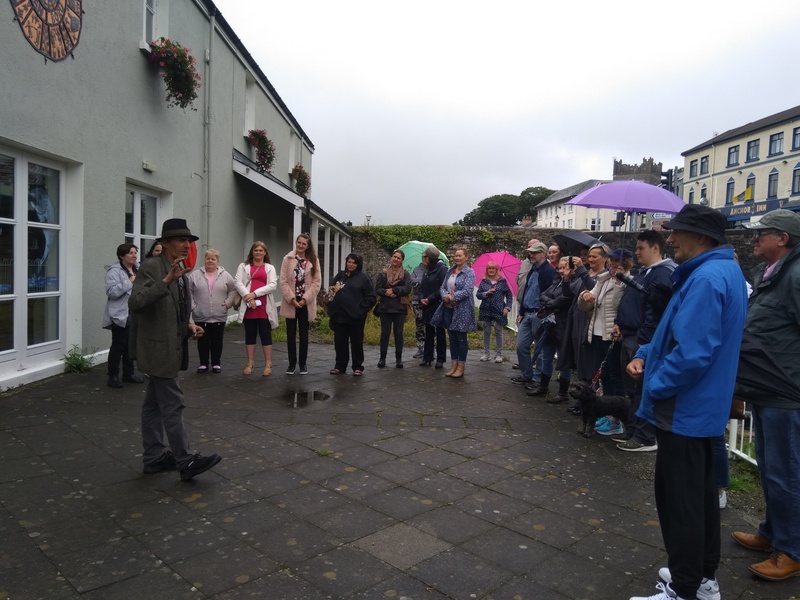 Tony O’Brien, Deputy Mayor of Clare, congratulated everyone involved and stated that he was delighted to witness the unveiling of the shield in Killaloe. Tony also commended the Féile Brian Ború committee for their continuous work and dedication over the past 21 years even through challenging times. Mark Wilson (Blacksmith); Suzi Lewisohn (Silversmith); Suzannah O’Reilly (Artist/Printmaker); Séan Kierse, CELT (Centre for Environmental Living & Training); Clare County Library; Killaloe Library; Kincora Call; Clare County Arts Office; North Tipperary Arts Office; Nard Slabbers – East Clare Repairs; Sarah Devane; Úna Kierse; Paul Mc Namara, George Hickey, Charlie Henniger, Ballinahinch National School & all the local schools; all those who took part in the Copper Craft Workshops during Féile Brian Ború 2014 and all the sponsors of Féile Brian Ború 2014 . 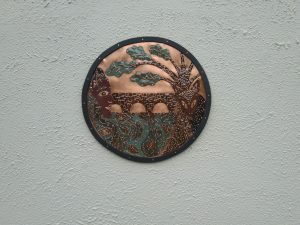 This shield is mounted on the wall outside the Killaloe Library/Brian Ború Heritage Centre and is well worth a visit! 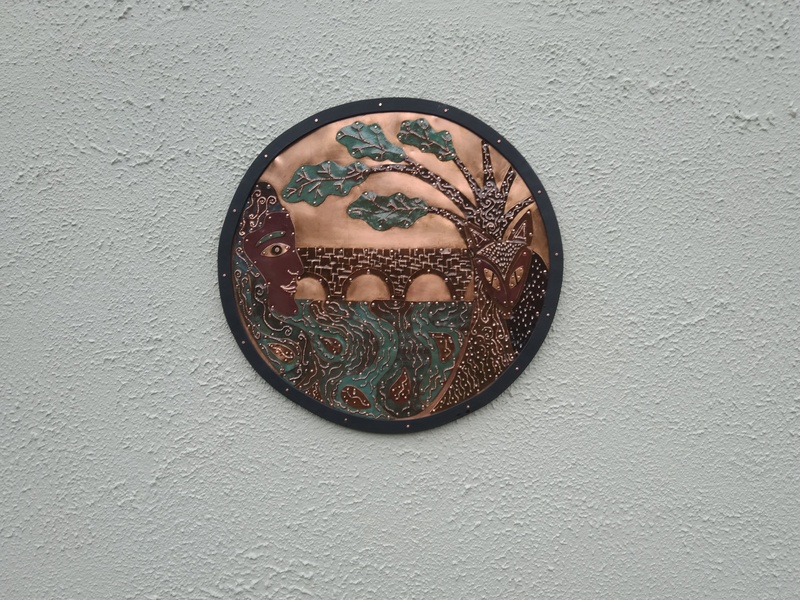 This piece was commissioned by the Féile Brian Ború committee as a way of commemorating Brian Ború in his native place in 2014 and in the future. 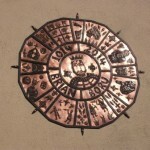 During Féile Brian Ború 2014 (3rd – 6th July), which commemorated the 1,000th anniversary of the death of Brian Ború at the Battle of Clontarf, the pieces for this unique mural were created by adults and children who took part in Copper craft workshops with Silversmith Suzi Lewisohn at the CELT Traditional Craft Experience. 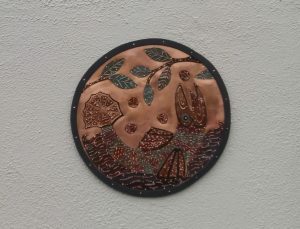 It is a two dimensional copper sculpture using different techniques including stamp work, riveting and wirework. 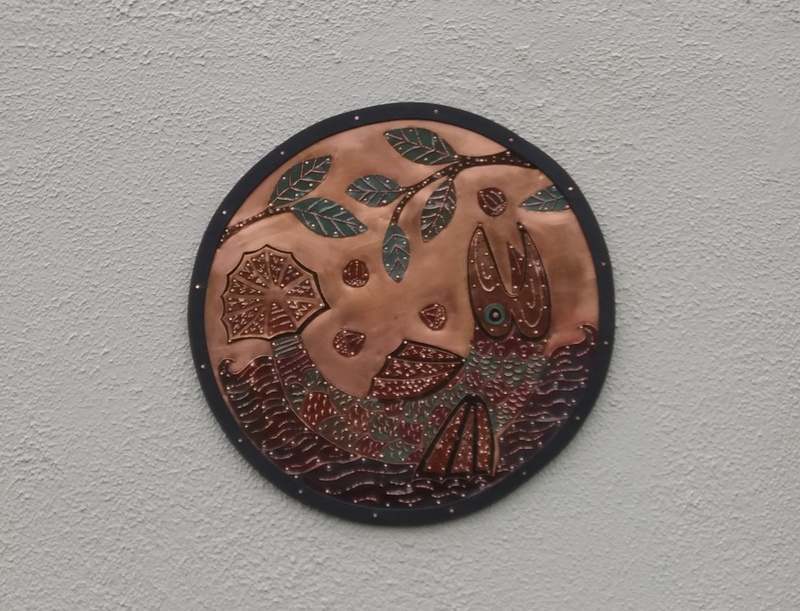 This artwork was created and finished by Co. Clare based blacksmith Mark Wilson and the design for this piece was taken from a woodcut created by artist/printmaker Suzannah O’Reilly with the help of Ballinahinch National School during the Artists in Schools Scheme earlier in 2014. We would like to thank in particular all the sponsors of Féile Brian Ború.We recongise that we are currently in a challenging environment and we would like to thank all those, who in spite of this, continue to support our local festival! It is with your support that we continue to build Féile Brian Ború each year, and that we were able to commemorate the millennium anniversary of the death of Ireland’s Greatest High King in style! Gold Sponsors – Ború Stoves Thurles, Féile Feis Committee, Flanagan’s on the Lake, Lakeside Hotel & Leisure Centre, Molly’s Bar & Restaurant, Ryan Stoves & Trident Holiday Homes. We would also like to express our huge gratitude to the organizations below who continue to provide sponsorship towards Féile Brian Ború – Fáilte Ireland, Clare County Council, North Tipperary County Council and Waterways Ireland. Last but not least, we would also like to sincerely thank all those who give of their time and energy to support all aspects of the festival – Irish Coastguard Killaloe, Killaloe Gardaí, Killaloe Fire Brigade, Killaloe Library, Killaloe Tourist Information Office, St. Flannan’s Cathedral, Bryan Brislane, Smith O’Brien & Ballina GAA Clubs, Ballina & Killaloe Tidy Towns Committees, Killaloe/Ballina Men’s Shed, Ballina Riverside Pool, Kincora Kids, Community Garden, Kincora Call, Sarah Devane, Úna Kierse, Keith Wood, Charlie McGeever, Sadie Scanlan, Killaloe Ballina 2014 Project, our local clergy, clubs, councillors & schools, to all the volunteers who gave of their time in any way in regards to this year’s festival, to all the event organisers who work so hard to help us to deliver a great programme of events and to everyone, from home and away, that came and supported the festival this year, we hope you enjoyed it and we thank you all for making it one of the best festivals ever! 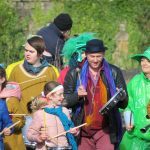 This year’s parade will leave Ballina Riverside Park at 2:30pm and it will follow the usual route, finishing in the Green, Killaloe. We hope you will join us in celebrating the 2015 Ballina/Killaloe St. Patrick’s Day Parade in style! Féile Brian Ború committee expresses sincere thanks! We would like to thank in particular all the sponsors of Féile Brian Ború. We recongise that we are currently in a challenging environment and we would like to thank all those, who in spite of this, continue to support our local festival! It is with your support that we continue to build Féile Brian Ború each year, and we hope that 2014 will see even bigger celebrations to commemorate the death ofIreland’s Greatest High King in his native place. Fáilte Ireland, Clare County Council, North Tipperary County Council and Waterways Ireland. Last but not least, we would also like to sincerely thank all those who give of their time and energy to support all aspects of the festival – Killaloe Ballina Community & Family Resource Centre, Killaloe Gardaí, Irish Coastguard, Killaloe, Killaloe Fire Brigade, Killaloe Library, Killaloe Tourist Information Office, St. Flannan’s Cathedral, University of Limerick Activity Centre, Smith O’Brien & Ballina GAA Clubs, Ballina & Killaloe Tidy Towns Committees, Ormond & East Clare Comhaltas, Clarisford SRS, Killaloe Ballina Festivals & Events networking group, Killaloe Ballina 2014 Project, Charlie McGeever, Sadie Scanlan, Tom Greene, Bryan Brislane, our local clergy, clubs, councillors & schools. A special thank you to our patron Keith Wood, to Alan Kelly for all his support, to all the event organisers who work so hard to help us to deliver a great programme of events, to anyone who gave of their time in any way in regards to this year’s festival and to everyone, from home and away, that came and supported the festival this year, we hope you enjoyed it and we thank you all for making it one of the best festivals ever! Historical re-enactors took some time out from their busy schedule in Brian Boru’s Living History Camp yesterday to visit the 2013 Féile Brian Ború Gold Sponsors – An Siopa Beag, Flanagan’s Bar & restaurant, The Lakeside Hotel & Leisure Centre and Molly’s Bar and Restaurant. Our other gold sponsor was the Féile Féis committee. A huge thanks to all! The 2013 Féile Brian Ború Shannon Swim took place on Sunday last, running from the Pier Head to the Bridge through the Canal. Thanks to the Killaloe Coast Guard Unit; Jonathan McGrath, Irish ParaOlympic Swimmer, who presented prizes to the winners and thanks to all who took part in the event. Over 60 children took part in the annual Féile Brian Ború Children’s Art Copmpetition on Saturday last in Killaloe Library. Thanks to Killaloe Library for hosting this event and to all the children who took part. 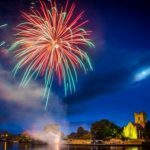 The beauty of the picturesque twin towns of Killaloe and Ballina, awaits you during the 20th Annual “Féile Brian Ború Festival”. As it is the birthplace of Brian Ború, we like to commemorate Ireland’s Greatest High King in style! With a busy programme of events, this years’ Festival is a perfect fun-filled event for all the family. It is also another milestone on the road to our build up to celebrations in 2014. From Thursday 4th – Sunday 7th July 2013, experience a variety of excellent events including, Viking Long Boat Trips on the River Shannon; Brian Ború’s encampment; historical guided tours on lake and land; Animal magic with their amazing display of animals; a stunning Fireworks display over the Shannon and the festival highlight – a live concert in the Lakeside Hotel with Hermitage Green – a 5 piece acoustic folk/rock band from Limerick. 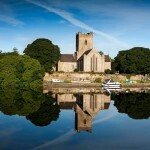 In the historic 12th century St. Flannan’s Cathedral, enjoy the Féile Pageant & Ceolchoirm; an evening with the National Harp Orchestra and the Limerick Pipe Band; guided tours of this stunning building; Féile Brian Ború lecture and the Craft Fair. AND THERE’S STILL MORE ….You can also enjoy the children’s Art Competition, the Exploration Dome; Teenzone; Garden Fete; Farmer’s Market; art exhibitions and displays including “Art in Windows”; pub theatre nights; music workshops; Féile Table Quiz; tag rugby; King Puck; Hurling and Camogie matches; Blessing of Boats; a range of water sport events including boat races, Canoe Polo, the Shannon Swim; and a Guinness World Record Attempt in Lough Derg by Christopher Healy to scuba Dive the distance of 20km without surfacing! We hope you will come along and help us commemorate Brian Ború in style – Fun and entertainment guaranteed!